We’ve always been committed to helping people enjoy food in new ways. With dedicated and knowledgeable service teams, we work with our customer partners to combine deep insights about food and consumer trends with fast and flexible manufacturing to drive higher levels of responsiveness and value. 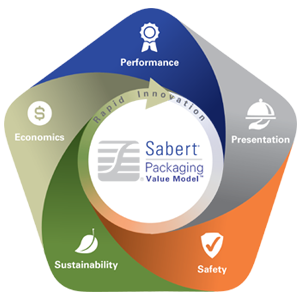 Our proven process infuses rapid innovation at every level in order to deliver products and solutions that encompass all five areas of innovative packaging: Performance, Presentation, Safety, Sustainability and Economics. Together, we are all working to enhance and advance the way people enjoy food – today and for generations to come. With advanced materials and innovative features, forms and functions, our products perform at the highest levels in the most demanding conditions and competitive markets. Our proven designs enhance the multi-sensory experience of seeing, holding, buying and enjoying good food. We bring your food to life in a way that drives sales, satisfaction and loyalty. From tamper resistant/evident features to interlocking lids and rounded edges, our products protect consumers as well as the food. This creates true value that consumers see and feel. From a broad range of recyclable and compostable materials to solar and geothermal facilities, our sustainable practices and products drive value by finding better ways to work with minimal impact on the environment. Our vertical integration and flexible manufacturing approach helps you drive down total costs. With continuous improvement and responsive service, we achieve the highest overall value for each packaging solution. Across all five areas, we combine our deep insights about food lifecycles and consumer lifestyles with our commitment to rapid innovation to deliver proven packaging products and solutions that drive value in a changing world.